On December 20th, 2006, Joseph Rago, an assistant editorial features editor at The Wall Street Journal, wrote a commentary in that fine newspaper entitled "The Blog Mob". In his piece the writer addresses the evolution of blogs (like this one, perhaps) in very critical terms. No surprise there, since the blogosphere has been nibbling off pieces of the print media's turf for some time now. Rago begins by acknowledging the potential of internet-based communications, saying "The ascendancy of Internet technology did bring with it innovations. Information is more conveniently disseminated, and there's more of it, because anybody can chip in." He goes on to compare it to the MSM (mainstream media). When addressing blogs as journalism he makes the following indictment: "The blogs are not as significant as their self-endeared curators would like to think. Journalism requires journalists, who are at least fitfully confronting the digital age. The bloggers, for their part, produce minimal reportage. Instead, they ride along with the MSM like remora fish on the bellies of sharks, picking at the scraps." He then suggests that blogs have more success as purveyors of opinion and commentary. However, he says the larger problem with blogs is quality. To quote him once again, "Most of them are pretty awful. Many, even some with large followings, are downright appalling." Because the technology on which they ride provides an opportunity for immediacy, Rago says, "The reason for a blog's being is: Here's my opinion, right now." Rather than providing a tool for resolution of divisive issues, he says it appears to encourage mobs and mob behavior. He goes on to equate a quotation attributed to Joseph Conrad on his judgment of newspapering - "written by fools to be read by imbeciles" - to the world of blogmania, too. Rago closes his long argument with the following paragraph: "Of course, once a technosocial force like the blog is loosed on the world, it does not go away because some find it undesirable. So grieving over the lost establishment is pointless, and kind of sad. But democracy does not work well, so to speak, without checks and balances. And in acceding so easily to the imperatives of the Internet, we've allowed decay to pass for progress." If all this rings a bell, it should. I think Mr. Rago has hit the nail squarely on the head with this one. One of the reasons, for example, that I created this blog was to bypass the editorial process I encountered in the local newspapers. I've readily acknowledge that the editors almost always made my contributions better, but it was very frustrating to have one's work disemboweled as was the case with one recent submission to the Daily Pilot. As those of you who have read both my commentaries published in the local newspapers and these blog entries certainly know, I'm less patient with the blog. I readily admit it. There's a certain feeling of liberation - and apprehension, quite honestly - to know that once you "publish" the blog it's out there for all to read, typos and marginal grammar included. Since creating A Bubbling Cauldron eighteen months ago I've become a frequent reader of many other blogs, most of which have an Orange County orientation. Some, published by local newspapers, tend to be slightly boring. Others are provocative and, many times, frustrating as I try to follow the train of thought of those "commenting" anonymously on a particular posting. Some degenerate into virtual school yard squabbles in hyperspace, with name calling and invective used much too frequently. Personally, I like the opportunity to entertain rebuttals and publish them or not, depending on my mood or the language used by the commentator. I suspect many of us who author blogs get swept up into the process and think that our opinions are actually important to many people. The fact is, one item published in the local newspapers reaches many more readers and is, therefore, potentially much more influential in the arena of ideas than this feeble effort, for example. 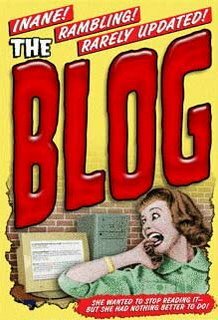 I think blogging has a place in our society today. I don't think it has matured enough to be viewed as much more than a hyperlink megaphone, allowing the authors to crank up the volume and bellow into the wind. Some authors have it figured out, though, and produce thoughtful, well-researched snippets of information and opinion. Most, however, seem much less disciplined and appear willing to bellow, bore and berate instead of insightfully, intelligently inform. So, if you're into cyber-shouting matches, blogging is the thing for you. As far as I'm concerned, I'm just glad you're here., reading what I write and responding to it.